These inverted belly button bars have a 10mm (3/8") 316L surgical steel bar, and are worn inserted downwards into the piercing. 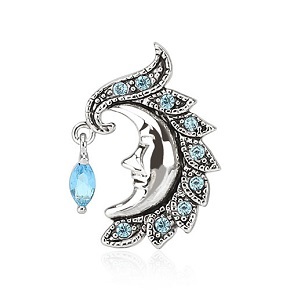 The moon design measures 22mm x 11mm, and features nine small light blue stones and a tiny jewelled teardrop dangle. The best eCommerce software by ShopFactory powers P12789. All-in one eCommerce and shopping cart software.